Attention, Aldi's shoppers: Do not be alarmed. The big man with a megaphone is harmless. We think. 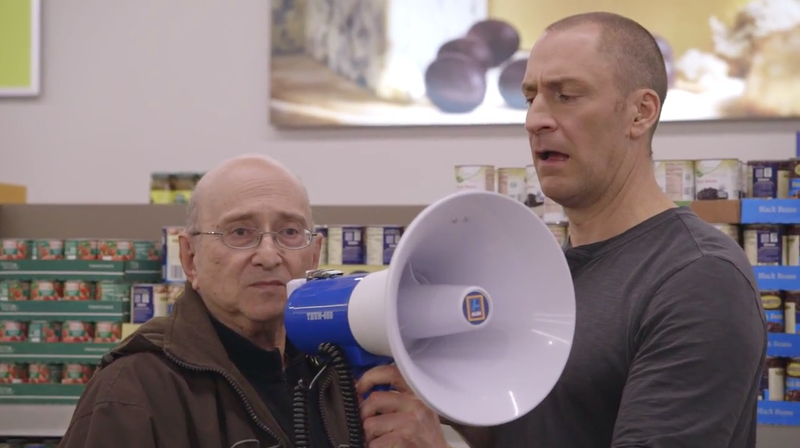 Comedian and TV host Ben Bailey trades in his cash cab for a grocery cart and goofs around with Aldi customers in this Web video series created by Weber Shandwick for the discount supermarket chain. The company plans to launch 45 stores in Southern California next year, and the campaign will "help introduce Aldi's unique and quirky ways to new markets and neighborhoods," says Weber executive creative director Jim Paul. Under normal circumstances, those quirks don't include Bailey, armed here with an amplifier and whirling police light, accosting shoppers with questions (mostly, he asks what they like about the store). Still, it's all in good fun. The dude's down-to-earth, regular-guy persona feels right for a chain that charges folks to use its carts and makes them bag their own groceries in order to keep prices down. Bailey, former host of Discovery Channel's Cash Cab, shot the hidden-camera spots in April at a Chicago-area store. "People were quick to call out their favorite products and how much money they save each month," he says. Indeed, the customers seem to be having a great time. For them, it was a change of pace from the dairy-case doldrums, no doubt. And, as advertising, the approach offers something a bit unexpected for the category (unexpected, though not supergeil). A special shout-out goes to an elderly shopper named Herb, who basically steals the show with his high spirits, good-natured kibitzing and quips like, "Ben Bailey?! Never heard of you." Herb will have you rolling in the aisles.